NC SILENCER: NEW! 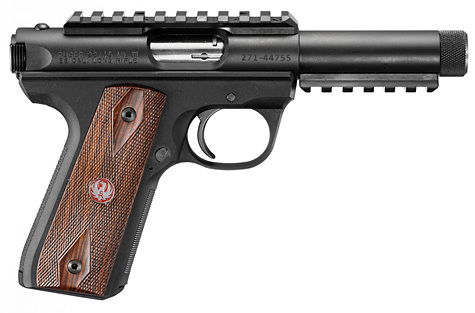 Ruger 22/45 threaded barrel rimfire pistols are here. NEW! Ruger 22/45 threaded barrel rimfire pistols are here. In a stroke of marketing genius, Ruger & Co. recently introduced THREADED BARREL versions of their popular 22/45 rimfire pistols! Now you can get into the silencer game cheaply, with a proven and accurate host weapon. Get the pistol and your choice of a .22 cal suppressor at the best place to buy silencers (and guns) in NC. Get email updates when NC SILENCER publishes a new blog post! NC SILENCER is a NC based Federal Firearms Dealer specializing in Class III/NFA items. Our expertise is silencers. NC SILENCER operates as a special-order suppressor online retailer. We believe that no home is complete without a gun or two (or twelve), with silencers, of course... to make them that much more fun. And easier on your ears. So, our goal is to make silencer ownership as easy as possible. Want proof? Contact us and find out for yourself. Give us a shot... you'll be glad you did. Copyright © 2014 NC SILENCER, a division of Easy E Enterprises, LLC. Awesome Inc. theme. Powered by Blogger.